Long Beach Mayor Robert Garcia said Wednesday Southern California port and political leaders are continuing a dialogue with the Obama administration to develop a plan that will ensure U.S. commerce will never again be crippled because of problems encountered during labor negotiations. 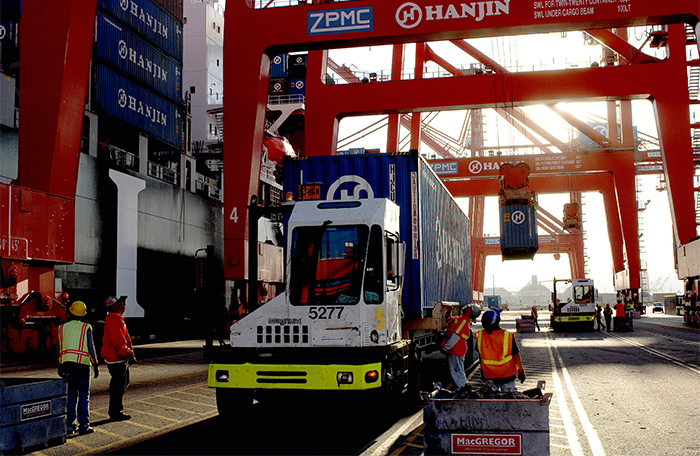 West Coast ports are still recovering from the congestion that resulted from difficult contract negotiations between the International Longshore and Warehouse Union and the Pacific Maritime Association. The talks were marked by ILWU work slowdowns that lasted from early November until a tentative agreement was reached on Feb. 20. When it appeared that the negotiations were going nowhere late last year, and West Coast ports were becoming crippled by the congestion that resulted, the mayors and port directors in Long Beach and Los Angeles participated in almost daily conference calls with President Obama’s economic advisers. The president in early January sent Labor Secretary Thomas Perez to San Francisco to help mediate the negotiations. He was joined briefly by Commerce Secretary Penny Pritzker. Early in the week ending Feb. 20, President Obama reportedly told the PMA and ILWU that if an agreement was not reached by that Friday, he would ask both sides to move the negotiations to Washington the following week. The tentative agreement was announced late that Friday, and the ILWU membership will vote on the contract next month. Garcia told a luncheon meeting sponsored by the Pacific Merchant Shipping Association Wednesday that discussions with President Obama’s economic advisers continue, with the goal being to ensure the nation’s economy is never again “held hostage” by West Coast labor negotiations. “We have to make changes in the system to make sure this doesn’t happen again,” he said. Meanwhile, the ports of Long Beach and Los Angeles continue to recover from the congestion of the past year. Both ports in March announced near-record monthly container volumes. The Marine Exchange of Southern California earlier this week reported that container vessels at anchor dropped briefly to two, the lowest number since the slowdowns began in November. Also, he said, the port directors and mayors have been visiting customers throughout the U.S., Asia and Europe to rebuild the reputation of the nation’s largest port complex and to discuss recent improvements intended to bring about long-term efficiencies in cargo-handling and gate transactions. The fact remains that when it comes to strategic location in the U.S.-Asia trade lanes and the more than $6 billion the ports are investing in marine terminal, rail and roadway infrastructure, “no one can compete with us,” Garcia said. “We have the largest capital investment program in the U.S.,” he said. Garcia also cited the cutting-edge technologies in cargo-handling and emissions reductions that are being developed in Southern California’s maritime sector, led by the ports’ technology advancement program. “Something exciting is happening. The challenge is to think about what this industry will look like in 10 years,” he said.